Great news for Angel fans! 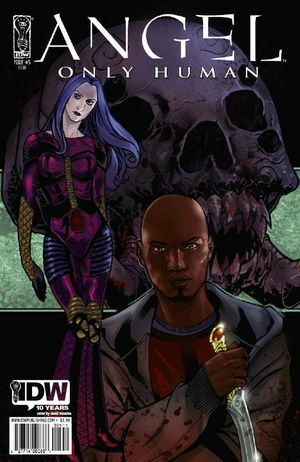 We’ve got Angel: Only Human #5 up at TFAW.com! As Gunn faces down the last of The Scourge and makes a desperate last stand, Illyria faces off one last time with her old “pet,” Baticus. How do you defeat a demon who keeps growing back all his parts? But it’s the gruesome discovery that Gunn makes that could change the entire game. Don’t miss the epic conclusion to this exciting story from team Lobdell/Messina. Angel: Only Human #5 arrives tomorrow, and we couldn’t be more excited to see what happens. Due to a communication error with our supplier, Angel: Only Human #5 wasn’t offered as a pre-order at TFAW.com (or any other comic book shop) until today. Normally, when comics arrive in our warehouse, the every day low pricing kicks in and the pre-order savings disappear. Not the case with tomorrow’s release of Angel: Only Human #5. Order by 11:59PM (PST) December 27, 2009 and you’ll save 20% regardless of whether you place a pre-order or in-stock order. We do, however, urge you to place a pre-order now so the issue will ship according to your pre-order shipping schedule. You’ll save on shipping that way. Note to Subscribers: Even if you have a subscription to Angel: Only Human, you’ll want to manually order your copy of Angel: Only Human #5 because it was not picked up in the subscription process at the end of October. We apologize for the inconvenience. ORDER ANGEL: ONLY HUMAN #5 TODAY–JUST $3.19 THROUGH 12/27! Previous article Iron Man 2 Preview! Geek in the City Is Going DOWN December 29!